Next regular update is Friday, February 8th. Saturday morning at 11:31, Central Communications dispatched a call for a structure fire located at 453 Newhall Street for a reported working basement fire with people trapped on the second floor and unable to escape. Engine 2 and Rescue 2 out of Circular Avenue arrived first at 11:35 and found three people in need of immediate rescue, hanging out of second floor windows with smoke billowing out around them. Firefighters made two ladder rescues from the front of the home and one ladder rescue from the rear. 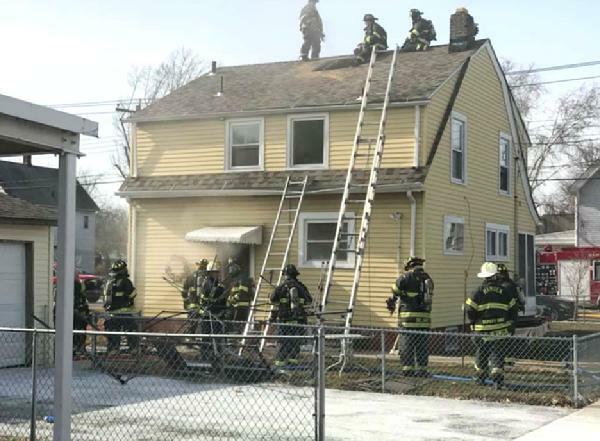 A fourth resident, who was able to escape on his own prior to the arrival of the fire department, was transported to Yale New Haven Hospital for treatment of smoke inhalation. The residents rescued from the second floor declined further medical treatment. Fire crews suppressed the basement fire and continued searching the home for additional victims. Extensive overhaul was required after it was determined the fire had extended into interior walls on one side of the building. Hidden fires and hot spots were located and extinguished. Battalion Chief Gary Couture declared the fire under control at 12:12 p.m. The first and second floors sustained smoke and heat damage, the basement had heavy fire damage. Parishioners from the Faith Tabernacle Church, nearby on Newhall Street, provided emergency shelter for the displaced family. They were assisted by the Hamden CERT team until the arrival of Red Cross representatives, who arranged for emergency lodging. There were no firefighter injuries reported. The cause of this fire is under investigation by Hamden Fire Inspector Ralph DiFonzo Jr.
Engine 2, Engine 3, Squad 1, Truck 1, Rescue 2 and Car 3 responded on the first alarm. Additional responding companies were Engine 5, Engine 9, Rescue 1, Vol. Engine 8, Car 1, Car 4, Car, 7 and Car 55. All units clear by 2:06 p.m. The website thanks the Fire Chief's Office for providing this article and photo. "Every fire officer, from a newly-minted lieutenant to the chief-of-department understands that this job runs on the example set by senior members. In fact, most chiefs will tell you that just as new recruits are placed with senior firefighters to learn the trade, so too are new lieutenants place in the same houses to depend on the informal leadership of veterans." Chief Gary Merwede spoke those words before the members of Platoon 2 last Tuesday morning as he presented Badge #1 to the department's most senior firefighter, Kurt Vogt, in the rotunda of Memorial Town Hall. Chief Merwede noted that he was proud that his predecessor, Chief David Berardesca, had resurrected the decades' old tradition a couple of years ago, when a new Badge #1 was presented to the department's most senior firefighter, Jay Connolly, who retired last November with nearly 38 years on the job. As he presented Badge No. 1 to the department's new most-senior firefighter, Kurt Vogt, the Chief remarked, "I believe with your history of professionalism, ethics and dedication to this job, and having been through so many doors with you myself, that you will wear it with distinction to yourself and honor to the department that all of us have dedicated our professional careers to." Firefighter Vogt and Chief Merwede both started on the job together in September 1994. 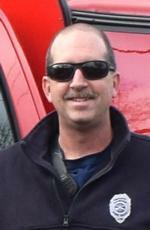 Vogt has been president of the Hamden Professional Firefighters Association, Local 2687 of the I.A.F.F. since 2011, when he succeeded then-Lt. Merwede. Starting in the 1930s, Hamden's active career firefighters were issued badges bearing numbers corresponding to the order in which they were appointed. The lower the badge number, the higher the seniority. The badges were re-assigned following retirements and firefighters less senior to the new retirees were issued lower numbered badges. Coveted Badge No. 1 was always worn by whoever was the most senior firefighter on the line. For reasons not completely understood, the department's numbered badges were discontinued in the early 1990s and more generic non-numbered badges were assigned. Thus, a tradition was lost - until 2016. A sampler of some of the numbered badges that were retired in 1991. They went as high as 114, maybe higher. Badge No. 1 had the tradition continued. rotunda for the presentation of Badge No. 1 to Firefighter Kurt Vogt. The Hamden Lodge 2444 of the Benevolent Order of Elks has announced Hamden Firefighter Kevin Recca as its choice for 2019 Firefighter of the Year. He will be honored at a March 30th dinner at the Elks Hall along with a Hamden police officer and Hamden citizen who have yet to be announced. Firefighter Recca has been on the job since 2000 and is perhaps best known to our retirees as the man who has chaired the Local 2687 annual retirement dinner committee for many years. The members of the HFRA congratulate Ff. Recca for this well-derserved recognition, and the Hamden Elks for once again making a very good choice. We sincerely regret to announce the passing on Wednesday of Fire Commissioner Richard Reilly, who was a current member of the Hamden Board of Fire Commissioners. Commissioner Reilly was the older brother of our own Capt. Raymond Reilly, who passed away suddenly in August 1987. A memorial service took place at North Haven Funeral Home on Saturday, February 2nd at 1 p.m., with a visitation from noon until 1 p.m. Please keep Comm. Reilly's family in your thoughts and prayers at this sad time. The Hamden firefighters' two-year contract had expired June 30, 1973. Negotiations continued. 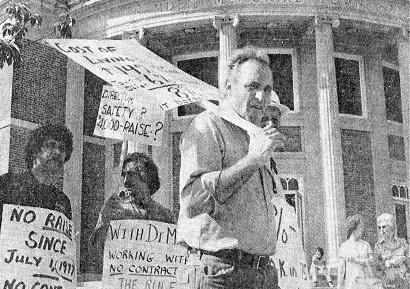 After incumbent Mayor William Adams lost his bid for a fourth term in November 1973, the Town and the Hamden Firemen's Sick Benefit Association suspended contract negotiations until the new administration took over in January 1974. 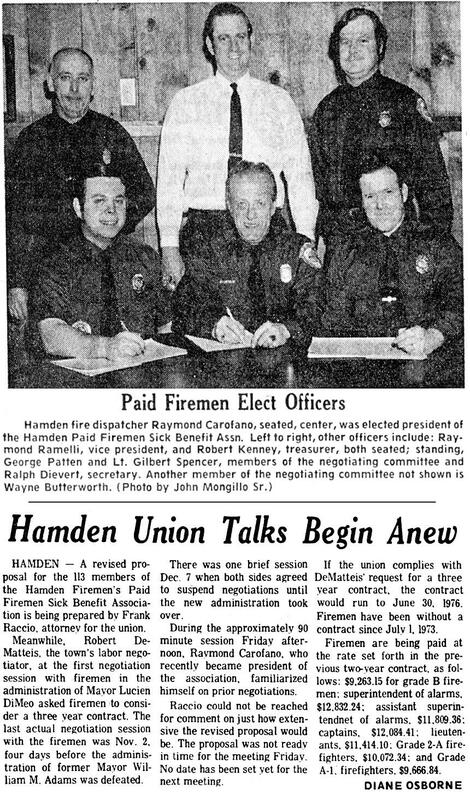 By February 1974, Hamden firefighters had been working without a contract for more than six months. Now, newly-elected bargaining unit officers would be facing negotiators representing newly-elected Mayor Lucien DiMeo. It would be a very rocky road for our bargaining unit. It was another year-and-a-half of negotiations before a new contract was signed - in late June of 1975. 1973 contract negotiations finally culminate in a contract - two years later! The three-year contract signed in late June 1975 was retroactive to July 1, 1973. In an era when the inflation rate was rising - 8.7% in 1973 and 12.7% in 1974* - and workers in the private sector were routinely receiving double digit raises, Hamden firefighters received 5% retroactive raises for the first and second years. In lieu of a similar raise for 1975-76, the Town gave firefighters a 1% increase and agreed henceforth to take over the 6% pension contributions of all personnel, just as they had done for Hamden cops the previous year. Had the Town kept that promise since 1975, the recent pension fund crisis surely would have been avoided. Neogotiations with the DiMeo Administration were just as difficult for the 1976-1978 contract, which was not settled until mid-1977. But the last straw that pushed Hamden firefighters into joining the I.A.F.F. came after the 1976-78 contract expired and talks with the DiMeo Administration stalled well into 1979. After working without a contract since June 1978, and without a raise since July 1977, Hamden firefighters joined the International Association of Fire Fighters in March 1979, when Hamden firefighters had worked thirty-seven of the sixty-two months of the DiMeo Administration without a contract. 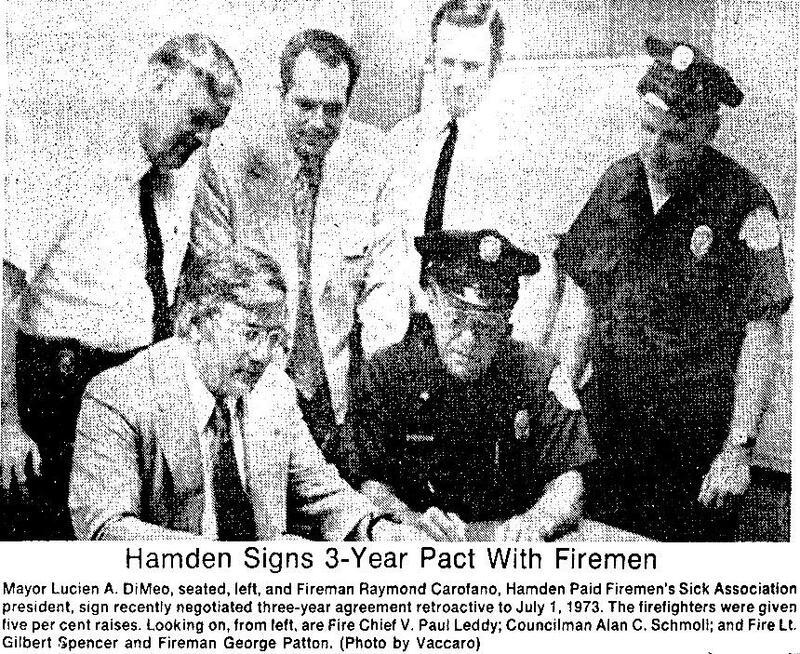 Finally, after working fifteen months without a contract, Hamden firefighters signed a new labor agreement in late September 1979, six weeks before incumbent Mayor Lucien DiMeo, just like his predecessor, lost his bid for a fourth term.